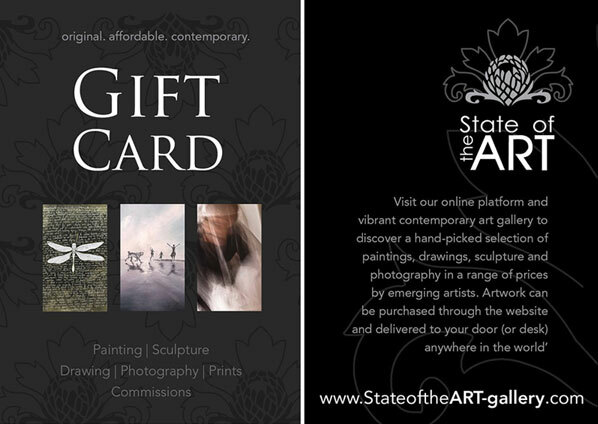 The StateoftheART gift voucher offers a smart alternative present for the most particular of art collectors. Plus, it helps you avoid the disappointment of having to give away a wonderful piece of art! Whether for a wedding, birthday, graduation or any other special occasion, there is no better gift than art. Choose a StateoftheART eGift Card for your online gift shopping which can be used to purchase artworks online from our contemporary art gallery so you can be sure people will choose what they love. The StateoftheART eGift Card will be delivered via email to your recipient immediately after you purchase it. Or, if you prefer, you can email it to yourself, print it out and present it personally. Make someone a happy art collector. Give the StateoftheART eGift Card today! Let us know if you would like us to personally contact the recipient of your gift and help them to choose an original painting, sculpture or limited edition art print from our catalogue of top emerging artists. Or they may choose to commission a new work of art, such as a portrait or painting of a place of personal significance.